For many in the CPA business, the term “sales” carries a somewhat greasy connotation. Perhaps you think if you do great work and your firm has a fine reputation, clients will just flock in. In today’s world, that’s simply misguided thinking. Surely there is a reason you’re reading these words now. Perhaps you’re a manager or senior manager at your firm, and you know to make partner you must demonstrate business development skills or create a practice for yourself. Maybe you’re already a partner, and you’re being pressed by management to somehow grow your book in today’s still-tough economy to replace lost work, or you’re facing a downward comp adjustment. Possibly, you lead an office, industry team or have been tapped by your firm to head-up a new initiative, and are striving for ways to stoke top-line revenue. Conceivably, you’re the CEO of a Top 100 Firm, and your shop has been languishing in the bottom quartiles of annual CPA firm growth rankings for years, with your firm becoming less and less relevant. As President Clinton said, “I feel your pain.” More than just feel your pain though, I passionately believe there are proven ways to radically change your situation—for the good, using practical, learnable methods and approaches, which are highlighted and taught in this book. If you’ve ever searched Amazon for books or videos about CPA sales and marketing training, or Googled to find dedicated CPA firm sales training from those who have personally built or grown substantial practices within a CPA firm environment—engaging in real accounting services prospect-sales sessions, you’ll find fairly limited results. Actually, you’ll find none, until now that is. 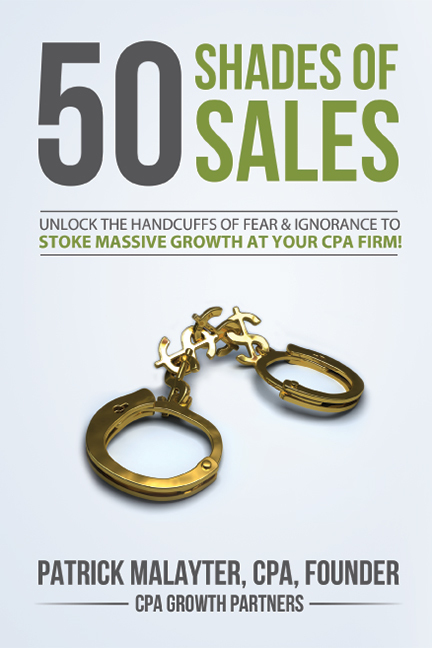 This tome fills that void with real world advice that has “crushed it” in starting/growing CPA-related businesses and functional practice areas. As you know, knowledge is only powerful when applied. Take action, and make a difference for your firm and yourself with the tools you’ll learn herein!